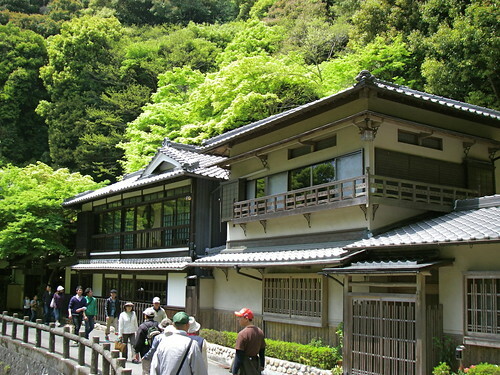 This year for Golden Week, the string of national holidays in late April and early May, we went to Osaka to visit the in-laws. 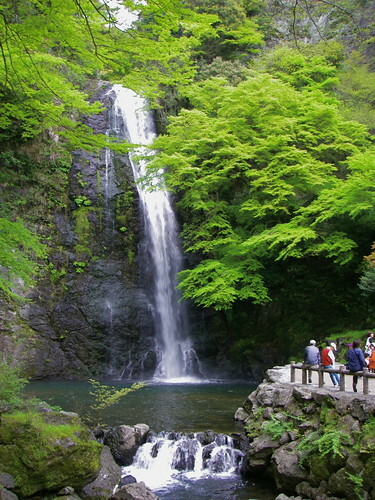 It wasn't exactly a Golden Week trip, as Hideaki only got one day off, but a long weekend is special enough so we're not complaining. 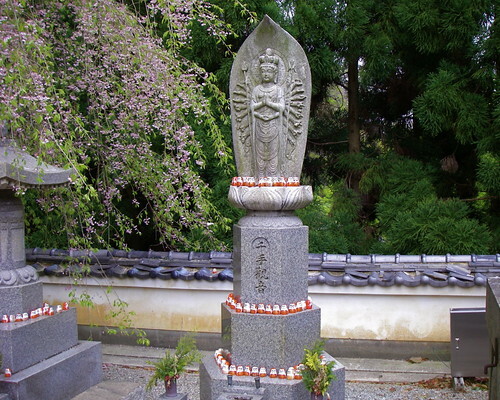 We managed to do quite a bit in two and a half days, starting with a trip to Katsuoji, a temple not far from my parents-in-law's place in Minoh, northern Osaka. 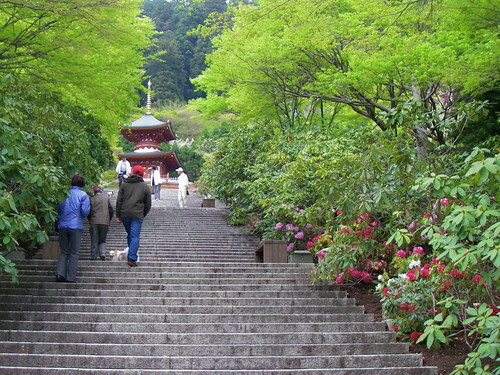 Katsuoji (you might want to hit mute before clicking) is set in the mountains with sprawling grounds that feature flowers in bloom nearly all year long. We caught the tail end of the cherry blossoms and the beginning of the rhododendrons, with a few early blooms seen above. 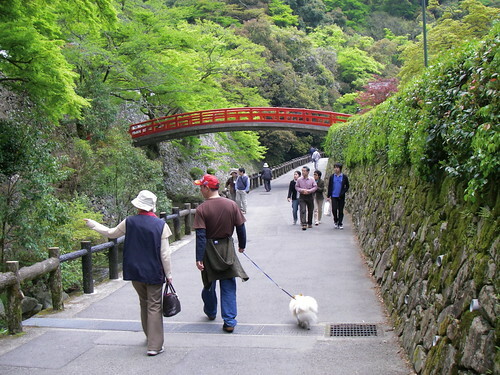 That's Hideaki above with Shiro, my dog-in-law. Shiro loves to take trips, especially in the car, and is such a good boy that I didn't even know he had come along until we were there and he got out. 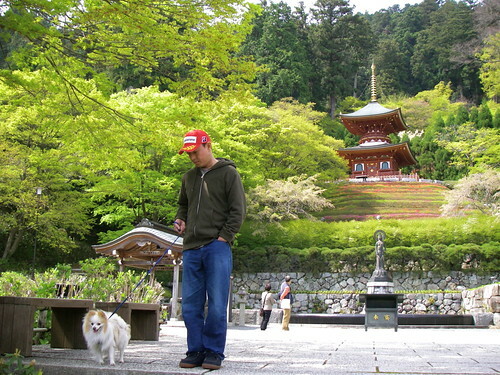 He's not such a good boy that he didn't relieve himself all over the temple grounds, but I don't think Buddha minded. 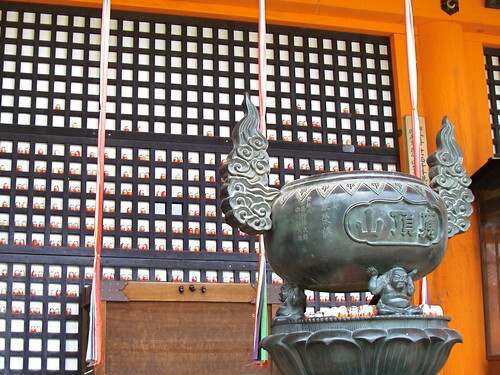 Katsuoji seems like a typical temple at first, with the usual buildings and statues. 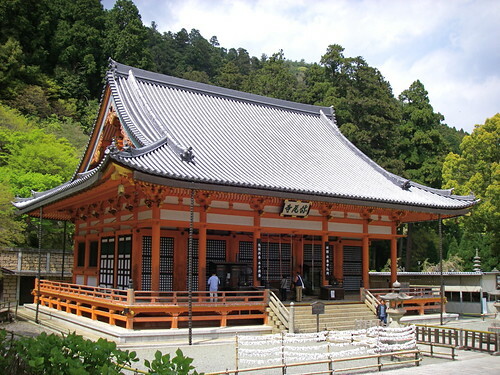 It does feature a large pond with Shinto shrine in the centre, but it's not unusual for the two religions to mix like that. 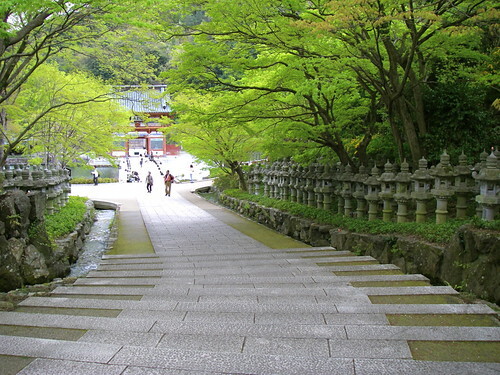 There is also a miniature version of Shikoku's 88 temple pilgrimage, where all you have to do is step on all of the 88 stones representing each temple, reducing what could be a months-long journey to mere minutes. 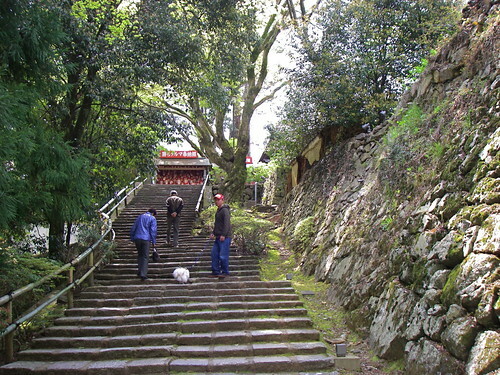 But other temples have similar shortcuts. It's not until you've walked around a bit that you start to suspect Katsuoji is a little different. You might first notice that the tiles topping roofs and walls, usually black, seem unusually colourful, as above. Or you may wonder at the flash of red visible as you near the top of a long set of stone steps. 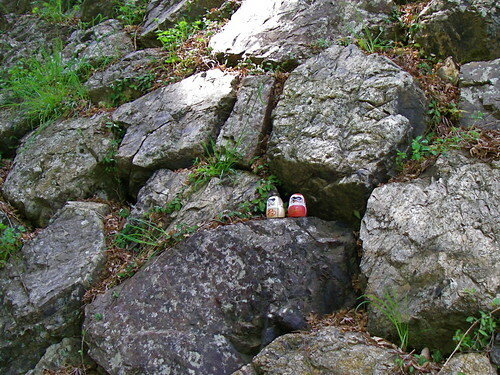 Then you'll probably notice tiny figures nestled in peeking out of stone lanterns, hiding in the crevices of trees, and nestled into stone walls. And finally you'll see that hundreds of tiny eyes have been watching you. 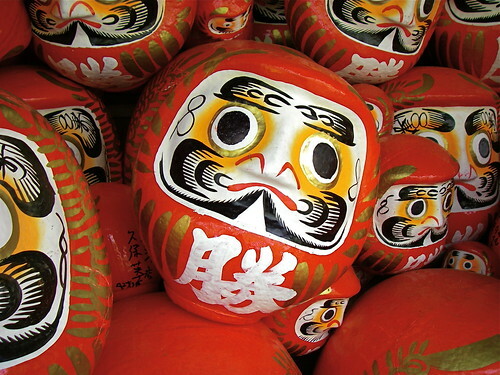 The eyes belong to daruma dolls, and they're everywhere, in all sizes. Some are tiny, some big, some look angry, some amused. But they all stare endlessly with two big, black eyes. The effect would be creepy if they weren't so colourful and cute. 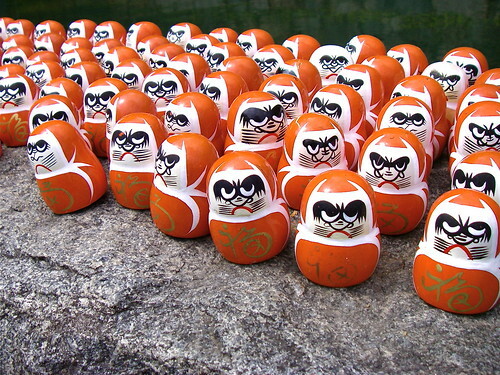 Daruma are lucky talismans, bought by those hoping to fulfill a wish or goal. They are usually sold with blank eyes, with their new owners drawing or painting one of the eyes black upon deciding on their goal, and filling in the other eye when the goal is reached. 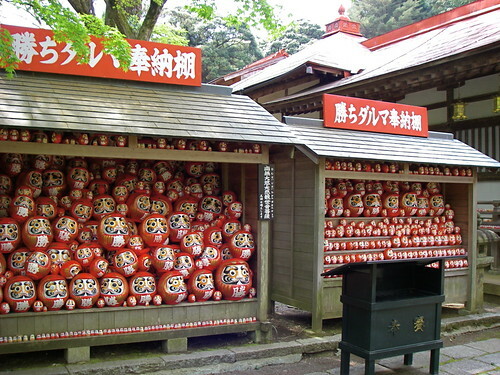 With the wish fulfilled, the daruma is returned to the temple it was bought at, and all the dolls seen in the above two pictures are returnees, representing hundreds of granted wishes. 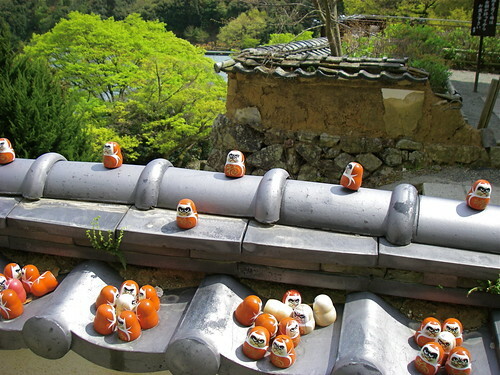 The tiny ones shown here are sold with their eyes already painted in, and are simply left on the temple grounds or taken home as a souvenir. I'm guessing these are for relatively minor wishes. 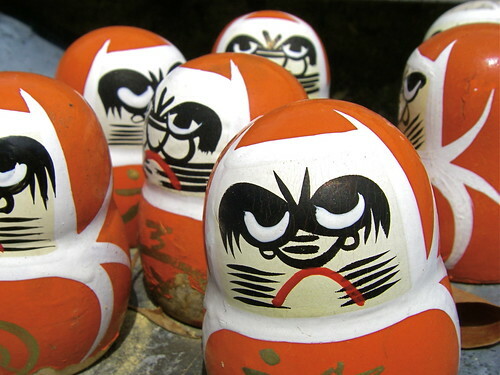 My parents in-law have a pretty impressive collection of these little daruma in their living room, bought at Katsuoji during their many visits over the years. I hope all their wishes have come true. 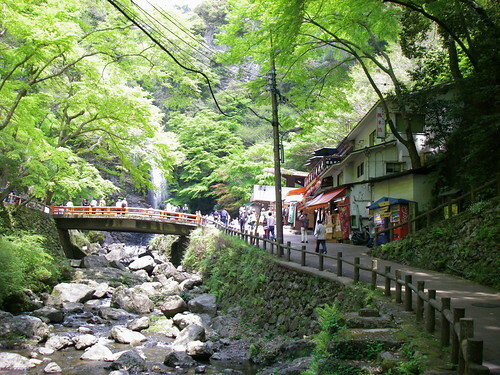 The next day we went to Minoh no Taki (Minoh Falls), located in the same Semi National Park (yes, that's an official designation) as Katsuoji. We took the usual route, a path starting at Minoh Station that passes several grand old ryokans (the area was once a popular hot spring resort) that have mostly been converted to souvenir shops. 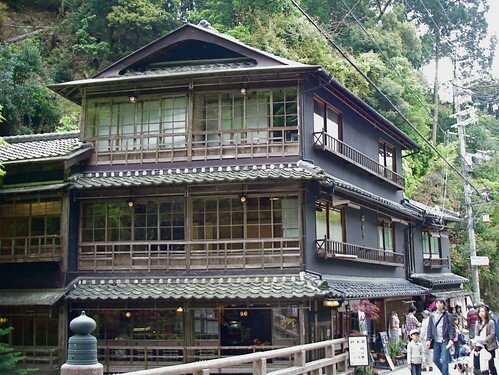 I really love the old ryokans, as they're mostly well preserved and retain all the amazing little details they were built with, right down to the wavy antique glass in the windows (for an example of what I mean, check out this full-size picture to see the beautiful maple leaf cutouts in the second floor balcony above). 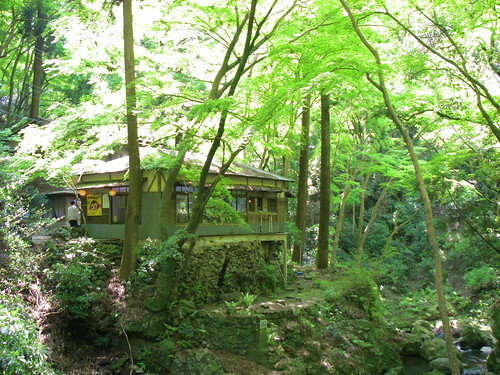 The buildings give way to a forest, with the path winding up into the mountains along a small river. 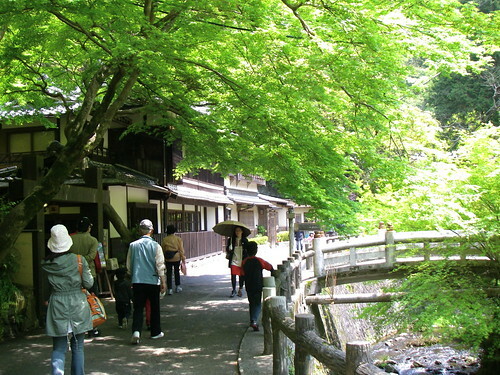 Most of the trees are momiji (Japanese maple) and they look just gorgeous at this time of year with their brand-new greenery. I've been to the park many times, but this is the first time I saw kawayuka (temporary riverside terraces). There were a few of them, and they all looked like nice places to stop and have a meal, but unfortunately they were all booked up. Apparently they were put up by the city and are only up for the spring, but this is the first year they've done it so hopefully they'll try it again. 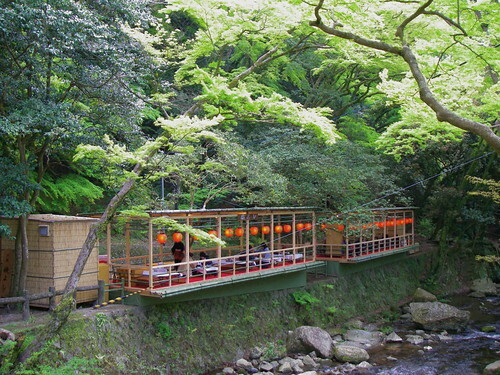 Kawayuka are more commonly put up in the summer, and are especially popular in Kyoto. 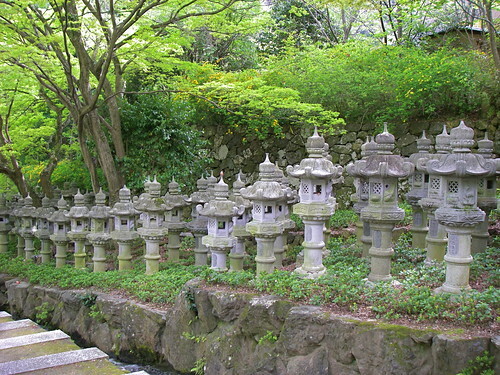 I'd love to see these again in Minoh, hopefully in the summer. The path ends at the falls, which were just as pretty as ever. Besides sightseeing, we did a lot of good eating. 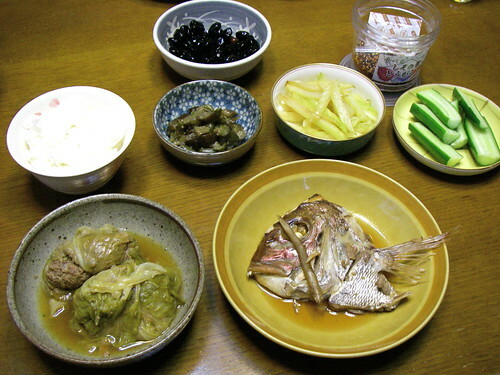 The dinner above included my mother-in-law's fabulous cabbage rolls (made with good wagyu and without tomatoes), rice, stewed eggplant, sweet black beans, sauteed celery, cucumbers for dipping, and a sea bream head poached in sake and soy sauce. 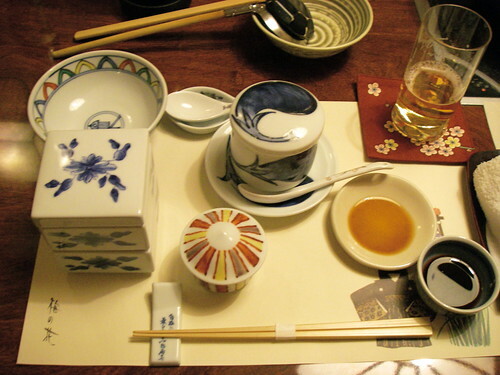 One lunch out was at a wonderful soba restaurant (if only I could remember the name). 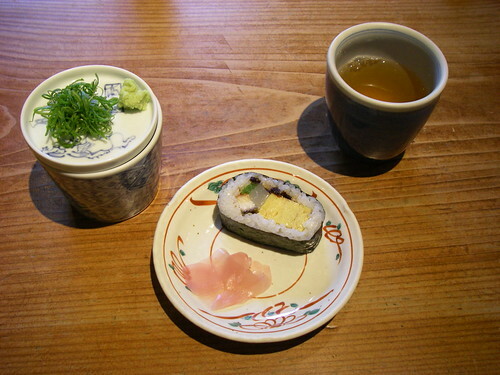 We started with a plate of futomaki (thick sushi rolls) which I usually don't like so much, as they are overly sweet and tend to fall apart while eating. These were the most delicious futomaki I've had, stuffed with thick omelet, unagi (grilled eel), and squid sashimi, all perfectly seasoned and rolled so nicely that it could easily be eaten in two bites without it all falling apart. 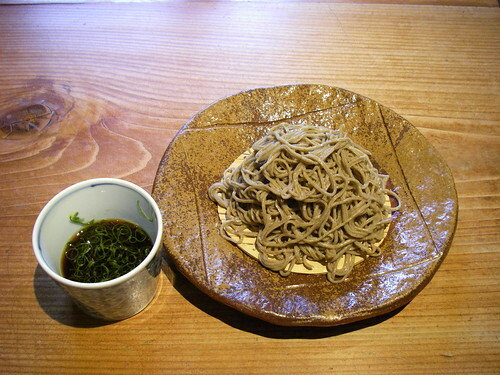 The soba was excellent as well, with a firmer texture and stronger buckwheat flavour than we usually get in Tokyo. 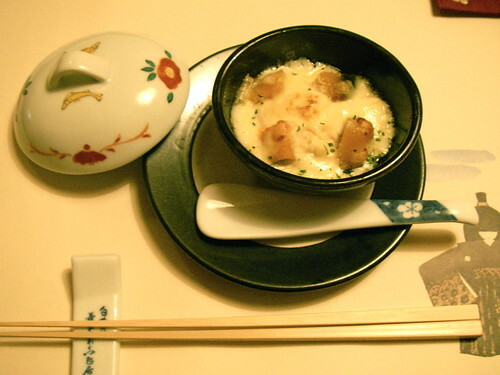 One night we ate at Ume no Hana, a restaurant specializing in tofu and other soybean products. 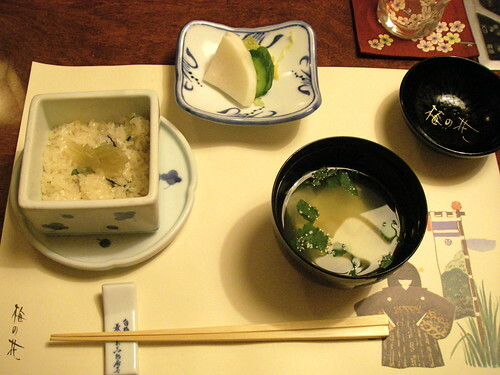 Ume no Hana is a chain, but does a good job at making pretty, tasty and healthy food served in fancy courses. They also have private rooms, which is always nice when the family is together. 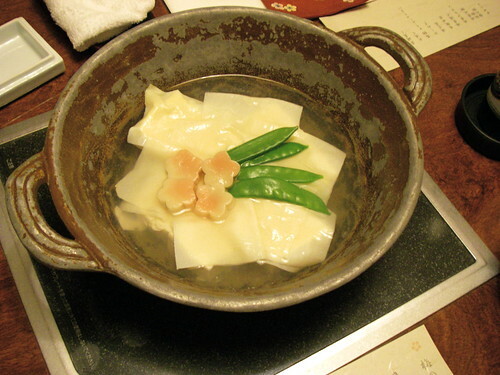 The pot above was the first dish to arrive; it was yudofu (simmered tofu) with yuba (soy milk "skin") and was cooked at the table. These are the first few courses in their cute dishes, all lidded and stacked and waiting to be eaten. 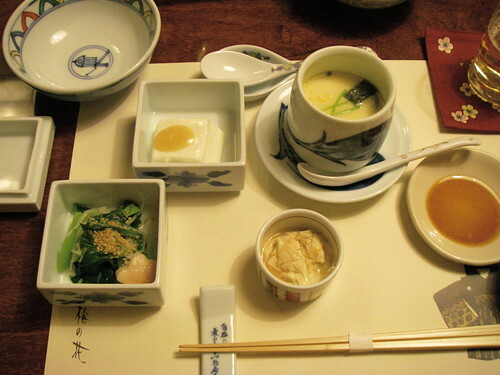 Here are those dishes ready to eat: komatsuna greens dressed with sesame seeds; a kind of firm sweet tofu called mineoka tofu; chawan mushi (egg custard) and simmered yuba. 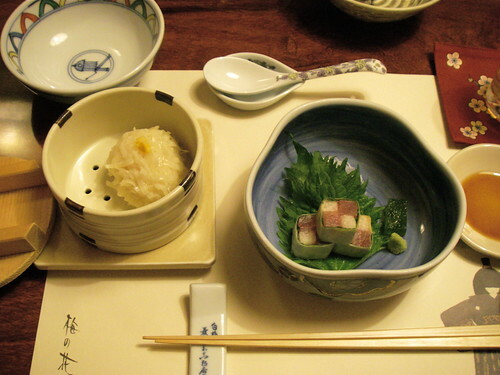 Next came tofu shumai (steamed pork dumpling) and rolls of tuna sashimi and yamaimo (mountain yam). This is the finished yudofu. 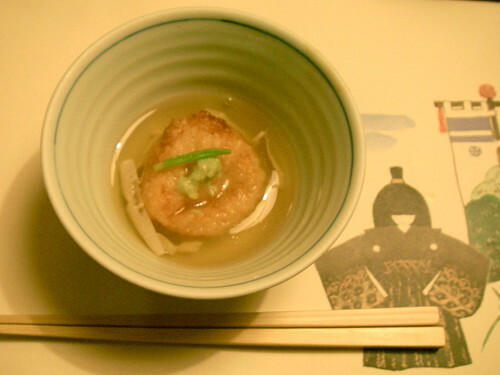 Next was a dumpling made of tofu and lotus root, served in a tasty dashi broth. It doesn't look like much in the picture but was my favourite dish. 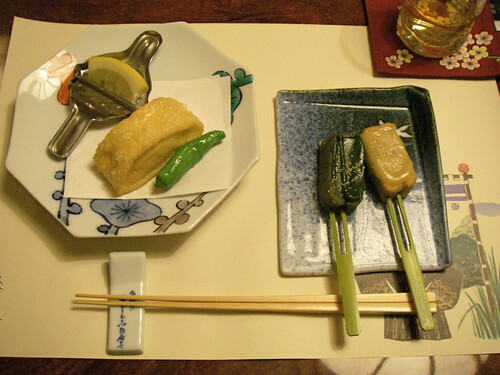 At left is ageyuba (deep-fried soy milk skin), at right is namafu dengaku (wheat gluten broiled with miso sauce). Next was yuba gratin, yuba and kabocha squash baked in cream sauce with cheese. 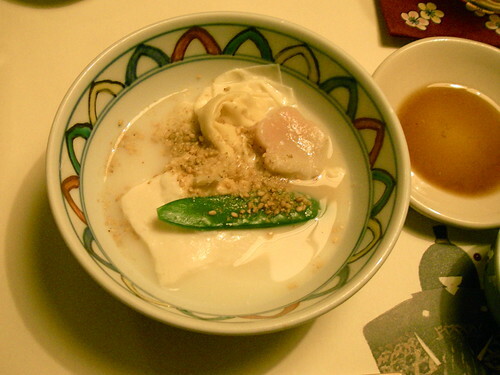 The savoury dishes ended with fuki gohan (rice cooked with butterbur), pickles, and yuba in clear dashi broth, and the meal ended with soy milk ice cream (not shown, and better than it sounds). 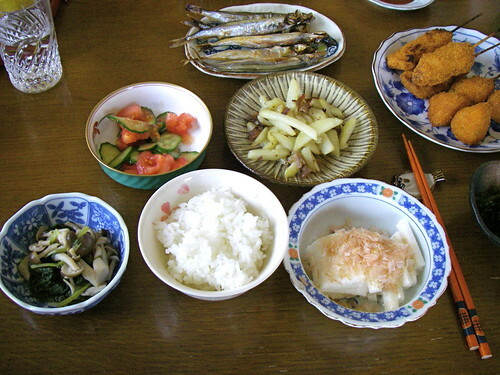 Our last lunch was shimeji mushrooms sauteed with spinach; cucumber and tomato salad; grilled shishamo (smelt); potatoes sauteed with bacon; store-bought kushikatsu (skewered and deep-fried pork and vegetables); raw yamaimo (mountain yam) with katsuobushi (bonito flakes) and rice. I think we ate as much that weekend as we would have if we'd stayed for all of Golden Week. Which is great, because visits to parents and parents-in-law just don't feel right unless you leave a few ponds heavier. glad you were able to spend some time with your in-laws. Beautiful! I absolutely love all your posts! 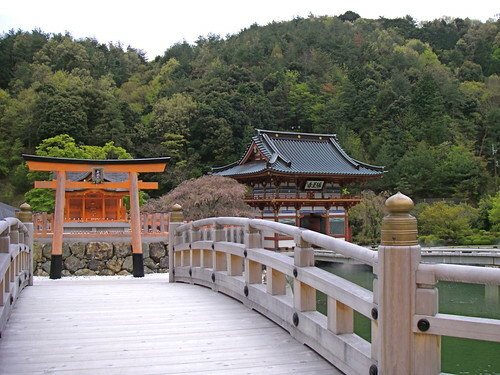 I am always very excited when I see sth new on your blog :) Japan is my dream destination so it's great to discover so many aspects of the country through your blog. Anyway, thanks for posting! Great photos! 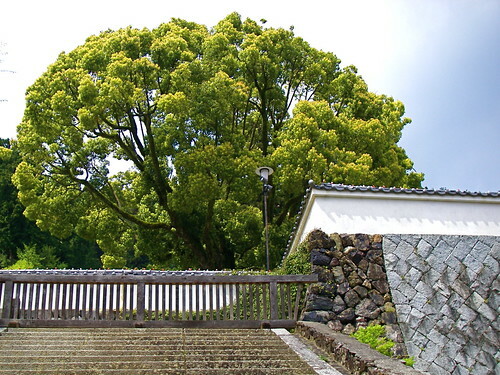 Didn't know about Katsuoji, will visit! Beautiful photos, as usual... and I love the food images. Everything looks so delicious and is gorgeously presented, as always. Spring in Japan...! Perhaps next year. Thanks for the comments! And sorry about the weight gain, Gronk.